Sabiha’s work is part of several private collections and has been exhibited in various shows, galleries, museums and publications. She has also been a featured artist on the Discovery Channel’s “Lynette Jenning Designs”, a nationwide televised program on homes and interiors. The Woodworker’s Journal eZine featured Sabiha’s work in their most recent issue. 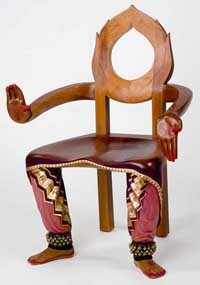 Sign up for Sabiha’s upcoming Creative Furniture Design hands-on class!